The Alaska claims to be the first to offer what GlacialTech coins as “Breathing Effect” which is a design that is supposed to reduce wind resistance and in turn, reduce noise. The breathing effect is created by a honeycomb fin design with holes drilled in each of the fins to allow air to escape from all angles. The nickel coated fins are very thin, but are protected from being bent by a simple framework that repeats itself throughout. The Alaska utilizes six heatpipes which are arranged in a V pattern to help guarantee that each of them will get the proper amount of airflow to keep cool. The 120mm (up to 55.7CFM) fan featured on the Alaska is neither sleeve bearing, hydra bearing, or ball bearing; instead, the Alaska features an “Entering Bearing” fan. This type of fan is supposed to leverage additional oil capacity within the fan bearing and implements a better seal than traditional sleeve bearing fans. This implementation is supposed to allow a longer usable life time by way of reducing friction further. 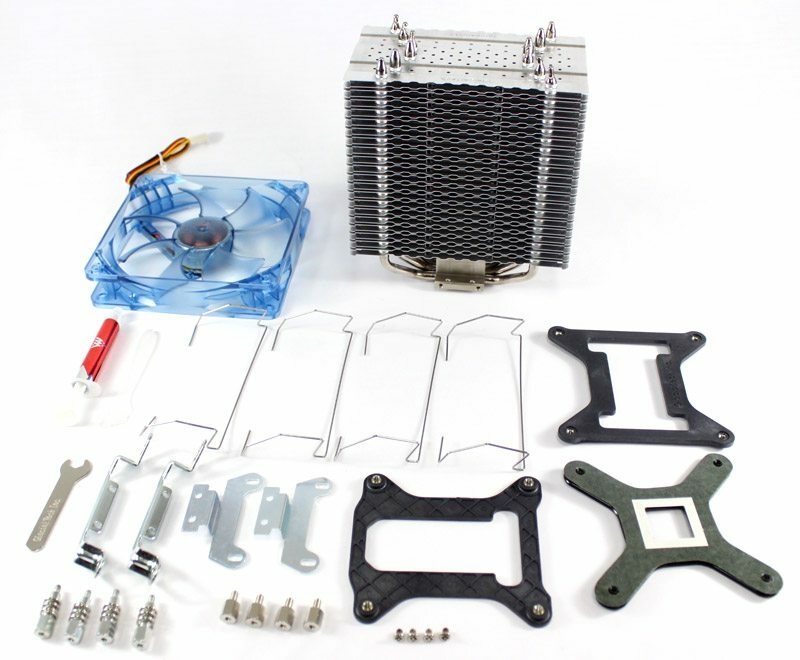 The packaging includes the Alaska itself, the mounting hardware, the fan, a manual, and some thermal interface material. When I said they included mounting hardware, I did not mean just a few items, there are twenty nine pieces of mounting hardware for you to thumb through for the “easy installation”. Looks easy enough… WRONG! 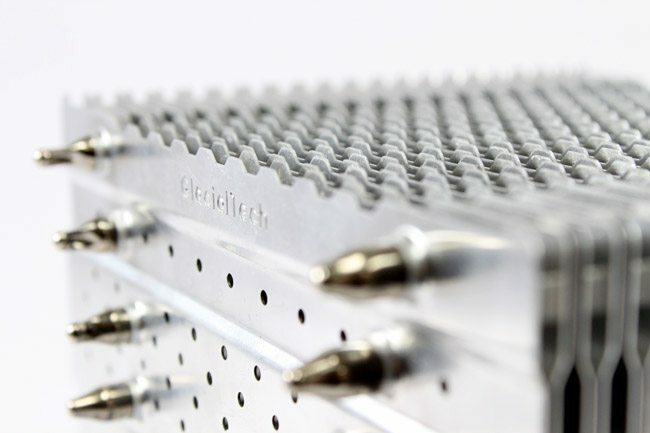 GlacialTech made this heatsink specifically to get on my nerves! Applying the TIM was easy, putting it all together… get your catchers mitt ready because you are about to hear some curses fly! The first thing that set me of was while attaching the clips for the AMD installation, it seems that one of the pre-drilled holes wasn’t threaded properly. After a bit of force, snap!, the stem and head of one of the screws were no longer married; time to break out the drill. 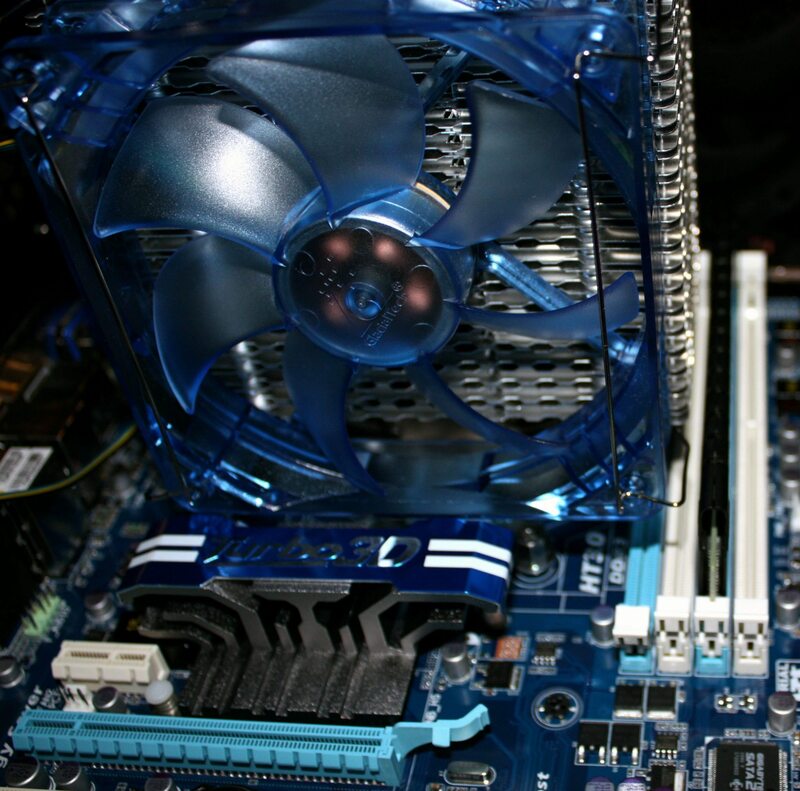 Secondly, the unit is held to the motherboard using the already installed AMD retention bracket by some screws. Holding the heatsink in place and tightening these screws proved to be an exercise in patience. 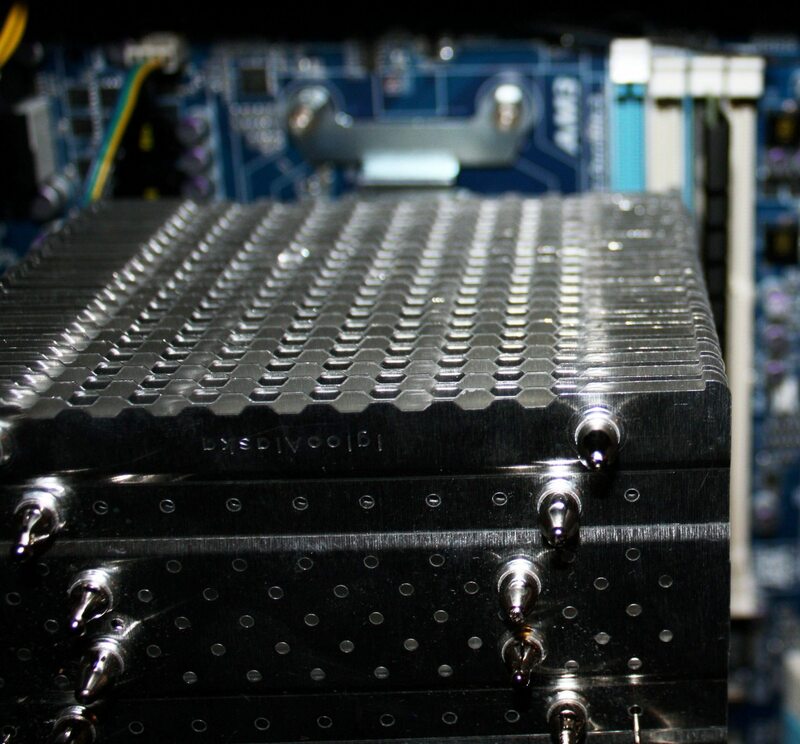 Then, due to the immense size of the unit, there is very little clearance, if any, for devices or items that may be close the the CPU socket. For our installation, we had to remove some memory in order for it to fit. 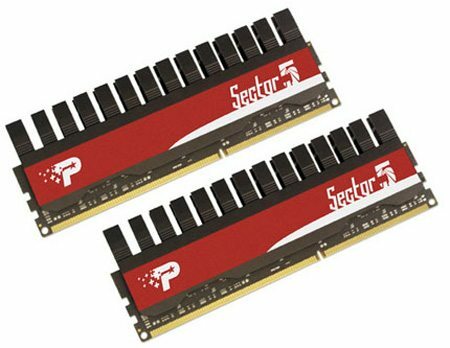 Mind you, this will not be the case for all of you as the memory installed in our bench PC has a head spreader attached to it and those of you that have naked RAM will have enough clearance. 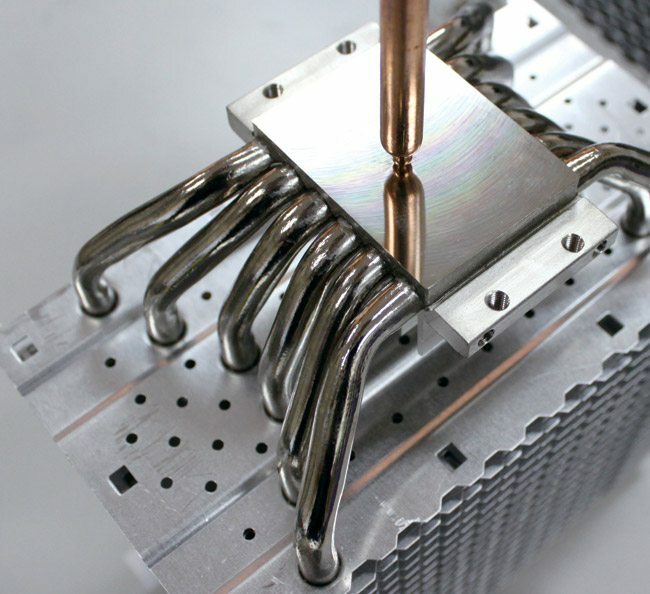 This is where the design should lend itself to an installation that is flexible enough to rotate the heatsink 90 degrees.